FA: Greg Barnes, John Hovell, 10/06. About 100 yards left of Golfer’s Route, up on a higher terrace, is a section of steep knobby rock that leads to a broad slabby ledge about 50 feet up, with a black bulge/roof above (and another slab above that). R2-D2 takes a steep knobby, pocketed face up a white streak between two black streaks, with one bolt visible about 20 feet up. There’s a flat area with small boulders near the base. The steep face with hidden pockets getting to the first bolt is a bit runout. 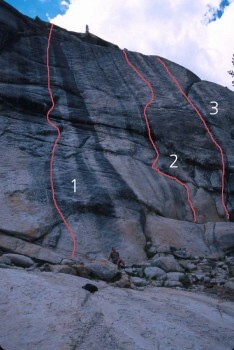 The route goes up and slightly right to a steep corner and a nearly invisible two-bolt anchor in the roof. Which SuperTopo guidebooks include a topo for R2D2?